Electronic and electrical appliances with aluminum strip with the development of the electronics industry is more and more concerned by the market, electronic and electrical appliances with the amount of aluminum strip is also growing.Today, we analyze the characteristics of electronic and electrical appliances with aluminum strip and key applications. Electrical and electronic products used in packaging aluminum strip , aluminum strip are not unfamiliar. 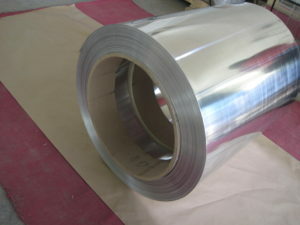 Aluminum strip , commonly known as tin paper, is a kind of metal aluminum flat manufacturing tools.Aluminum used in electronic and electrical equipment is mainly used in the packaging of electronic and electrical equipment. For example, the battery shell, point capacitor, etc. The reason why the aluminum strip market is popular, not only benefit from the development of the electronics industry, but also benefit from the characteristics of electronic and electrical appliance aluminum itself.Aluminum alloy strip has good electrical conductivity ,it is an excellent heat dissipation material. It is suitable for high power transformer, voltage stabilized power supply, communication power supply, purification power supply, broadcasting and television transmitting device, inverter power supply and other power supply products.Also used in the field of automatic control instruments and other power electronics products. Therefore in the future development of electronic and electrical aluminum strip will have a broader prospect. Electronic appliances use aluminum strip market prospect has been attracting the attention of haomei aluminum. Not only the introduction of advanced production lines, more large r&d investment. For in this niche play haomei development and scale advantage, creating more space for industry and imagination.